Christmas was on its way and there was at least some good news for fifty local folk whose jobs were rescued at Lord's Printers. Some 21 staff had been laid off in November and it was looking very likely that it could be the end with the receivers in. Thankfully an eleventh hour management buyout saved the jobs for those fifty people with further work coming in to keep things going into 1992. It wasn't such good news for a man who opened his door in Rodney House, Trafalgar Gardens to two men who was asking if he could change a £1 coin. The householder pulled some money out of his pocket including a wad of bank notes. One of the men punched him whilst the other snatched the money and they got away with £85. Todmorden Road had become a Brands Hatch according to local Councillor Mrs Edith Tate, or that's how she felt motorists were treating it as they sped down the road past her house. She was demanding that a traffic survey be carried out and some action taken. Councillor Tate might have also had a decision to make when the Lancashire Free Legal Action Centre, based in Blackpool, asked Burnley Council for a £25,000 donation towards its running costs. The LFLAC's main activity was challenging Burnley council's community charge collection procedures and the number of jailings. The council were hesitant but there again it would have been like turkeys voting for Christmas. Another councillor, this time County Councillor John Entwistle, had plenty to say. His problem was with the potential opt out for Habergham High School. He demanded that people be made aware of the implications and warned: "It will be a disaster for every other school." Magistrates warned Carol Hawk that she must keep her Staffordshire bull terrier Queenie under control. It had bitten a 12-year-old boy, one of two boys playing hide and seek, but Carol said it would not harm anyone and was a big softie. The boys said they hadn't approached the dog and neither had either of them provoked it but a neighbour said they had been kicking it. No wonder poor Queenie decided to take a lump of leg if that's what they were up to. 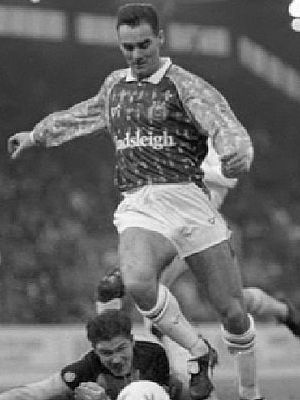 Burnley went into this cup tie against Rotherham United having beaten Doncaster in a first round replay at Belle Vue and Jimmy Mullen was able to name his strongest side for the tie with Chris Pearce now first choice goalkeeper again following Andy Marriott's return to Nottingham Forest. It proved to be a tough game for the Clarets but for almost an hour we had the bulk of the play and Rotherham were thankful to goalkeeper Billy Mercer who made a string of fine saves. He grabbed a Steve Harper cross to prevent John Francis getting an early goal and then made a good save to deny Harper after good work from Francis. Burnley poured forward but Mercer saved well from Roger Eli and then made his best save of the game to deny John Deary on the half volley after a knock down from Eli. It was still 0-0 at half time but Burnley had been the better side, and that's how it continued after the break. Steve Davis made a barnstorming run from the back but failed to get much power in his shot but then came the opener just before the hour. Deary crossed the ball from the left. It was headed down by Mike Conroy for Eli who played it back to the striker and CONROY made no mistake with a crisp finish. If Burnley thought that was the goal that had won them the match then it was very much a mistaken thought as the goal did nothing other than inspire Rotherham who were not going to go out of the cup without a fight. They gave Burnley a real fright. More than once they caused confusion in our box, particularly from balls played in from the left. We survived it and with less than two minutes remaining were able to wrap it up. Davis got the ball cleared from within our box and it reached Conroy around the half way line. He got a great touch to beat his marker and then played the ball through for Graham Lancashire for a run on goal. He got into the box and looked a certain scorer but then got a shocking touch that took him too far wide. However, from the tightest of angles LANCASHIRE got back onto the ball and squeezed it past Mercer and into the far corner. That was it. There was no way back now for Rotherham, the team that had beaten us in the league on the opening day of the season, and Burnley were in the third round of the FA Cup with the draw giving us a home tie against Derby County. Derby were riding high in the Second Division. They were in fourth place, behind leaders Cambridge United and both Middlesbrough and Blackburn Rovers. 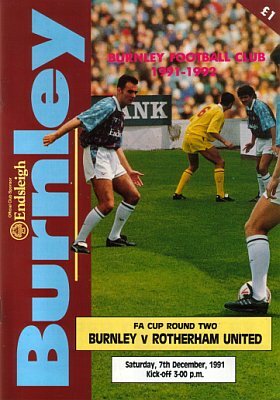 Burnley now had a home game coming up in the league against Scunthorpe United, something of a bogy team to the Clarets, as we continued to push towards that top place in the league. Burnley: Chris Pearce, Ian Measham, Joe Jakub, Steve Davis, John Pender, Andy Farrell, Steve Harper, John Deary, John Francis, Mike Conroy, Roger Eli (Graham Lancashire). Sub not used: Mark Yates. Rotherham United: Billy Mercer, Ally Pickering, Chris Hutchings, Mike Todd, Nigel Johnson, Nicky Law, Shaun Goodwin, Dean Barrick (Shaun Goater), Tony Cunningham, Don Page, Des Hazell. Sub not used: Ian Hathaway. Referee: John Watson (Whitely Bay). There was one league game played on the same day, that between Northampton Town and Scarborough at the County Ground and won 3-2 by the home side.